Sinn Féin leader Gerry Adams has welcomed what he called the "impatience" of the taoiseach (Irish Prime Minister) with the UK on Brexit. When asked about Irish border controls, Taoiseach Enda Kenny said he still did not have "clarity" on what the UK wanted in terms of the customs union. "We didn't cause this, we have to put up with the consequences," he added. Mr Adams welcomed "the fact the taoiseach expressed impatience" but said he should set out his own plans. He accused Mr Kenny of "being too slow and too mesmerised about what the British government is doing". The Sinn Féin leader made his remarks before a meeting of his party's national executive in Dublin - the first since last week's Northern Ireland Assembly elections. The last couple of days has seen some speculation that UK Prime Minister Theresa May may trigger Article 50 as early as next week, which would formally begin the process of the UK leaving the European Union. Mr Kenny spoke to reporters in Brussels on Friday after a two-day EU summit. Irish broadcaster RTÉ asked him to respond to speculation that Article 50 could be triggered before 15 March. "I can't confirm that," Mr Kenny replied. "I asked the prime minister this question directly yesterday and she said 'well, I did say before the end of March'." When asked if Mrs May had given any indication of the UK's intentions regarding its future relationship with the customs union, Mr Kenny appeared to express some frustration. "I speak in respect of the Irish government and the Irish people here. We didn't cause this, we have to put up with the consequences of it. "And in order to deal with the consequences, we have to know what the relationship that's being sought by Britain is, beyond having the closest possible relationship with the EU. "So I suppose Article 50 being triggered will bring some further clarity in that regard." Reacting to Mr Kenny's remarks, Mr Adams suggested that rather than be irritated with London's vague intentions about its future relationship with the EU, the Irish government should be setting out its own Brexit strategy. "The taoiseach needs to stop waiting for the British government. I know he is engaging with EU partners, but he must act in our national interest, at European level, to secure special designated status for the north within the EU," he said. Mr Adams was also asked to respond to remarks by Northern Ireland Secretary, James Brokenshire, who said Stormont parties could face a second snap election if there is no deal to restore devolution. "It is a sign of change that a British government is threatening us with an election," Mr Adams said. "Back in the day, the threat was martial law, internment, censorship, and lead and plastic bullets. So, Mr Brokenshire's threat is progress." 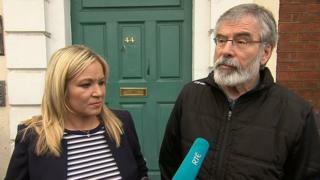 Sinn Féin's new leader in Northern Ireland, Michelle O'Neill, said she hoped there could be a way forward but said the "clock is ticking". She added that the Stormont talks had to be more about the implementation of existing agreements than new negotiations. Mrs O'Neill also called on Mr Brokenshire to release the "agreed" funding to allow about 50 Troubles-related inquests to proceed.